Visit West Yellowstone, Montana: 6 fly fishing tips for beginners. In a short conversation with a local fly fishing expert, you can gain knowledge that would take years to figure out on your own. Not only can a local expert give you the run down on the basics, they can set you down the right path for years to come. When you’re planning to fish a river for the first time, no one can help you like a local expert. Fly shop employees in West Yellowstone are eager to share knowledge with those wanting to learn. Knowing the best time to fish is a matter of knowing when trout eat specific insects. Mayflies, caddisflies, stoneflies, midges, and terrestrials make up the main insect groups that fish feed on. Each insect species has a specific time of year and time of day that they will be hatching or landing on the water. Luckily, you can learn most of what you need to know about any given insect by reading books devoted to local fisheries or speaking with local fly shops. If you know a little about the behavior of the insects, you’ll be much more likely to have a successful day of fishing. The importance of casting well is underestimated time and time again. It doesn’t matter how much knowledge or fishing experience you have, if you can’t properly deliver the fly to a given fish, you won’t be able to catch it. If you want to be able to cast successfully, you’ll need to have a sound casting stroke. You can easily attain a fundamentally solid stroke by taking a casting lesson and practicing at home and on the water. You’ll be thanking yourself down the road if you start your fishing career with good casting habits. The best fisherwomen and men take their time. When they get to their destination, they patiently observe and analyze the water before making a cast. Fish can settle in places that are surprising. You have a better chance of recognizing these sly hiding spots if you take your time rather than race into the river. Trout often rise subtly, and they can be easily missed if you’re constantly casting instead of watching. Take your time and you’ll be rewarded. No two rivers offer the same fishing experiences. Trout can be caught easily in some rivers but are too brilliant to be caught as easily in others. Starting with a forgiving river that contains naïve fish is a great way to get experience with casting to fish as well as hooking and landing them. Seeing a lot of action in your early days of fishing will allow you to develop your skills exponentially faster than if you struggle day in and day out on a technical river that is more difficult to catch fish. If you’re lucky enough to spend some time on a forgiving body of water, you’ll be ready to take on the trickier and smarter fish in no time. 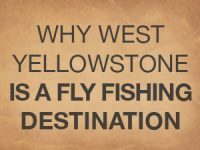 The guides in West Yellowstone are focused on one thing—making your fly fishing experience memorable and enjoyable. And you don’t have to be an expert. They offer everything from gear rentals to lessons. 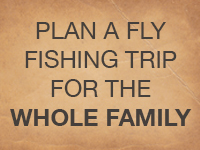 want to learn more about fly fishing?